Up for auction! 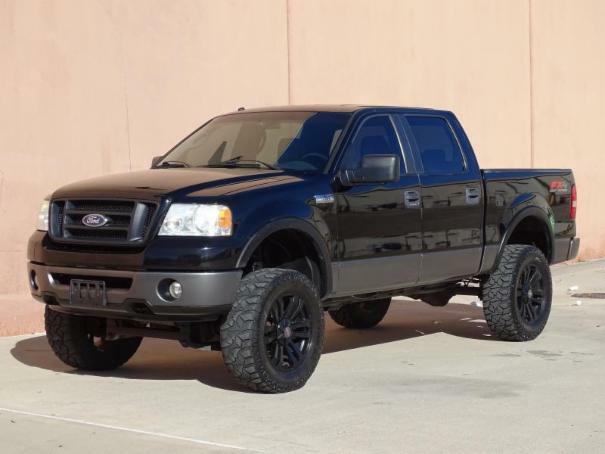 This is an incredibly clean, well maintained 2007 Ford F-150 Crew Cab FX4 4WD. The truck runs and rides smoothly! 159k miles! It is a non-smokers vehicle with no odors or burn marks. The title is clean! This truck runs and rides like a low mileage vehicle, It is optioned with FX4 Package, Tow Package, 4x4, Cruise Control, Steering Wheel Mounted Controls, Dual Exhaust, Bedliner and more. All gauges and electrical equipment are operating properly with no issues. Both a/c and heater work very well! The Black exterior paint is in great condition with no major signs of abuse. There are 1 or 2 minor scratches/dings on the vehicle, there are a few very minor touched up blemishes on the vehicle. This is just normal wear and tear, overall this is a very sharp looking vehicle. The tires are in great condition with plenty of tread life left!